In The Throne of Psyche, Marly Youmans sweeps back and forth between what is human and what is other, binding the two together or crossing the thresholds between them. A prize-winning writer of stories and novels, she pursues tales both otherworldly and earthy with passion and formal power in this eighth book, her second collection of poetry. The title poem’s narrative governs the entire collection in its yoking of eros to Psyche. 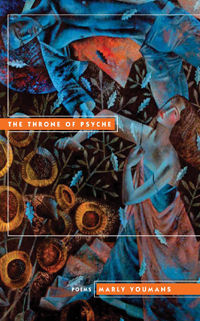 Psyche is the young girl brought in fear to a marriage chamber that transforms into forest as “The little stars” go “shrieking through the wood” and her childhood innocence is “struck asunder.” But she is more than mortal as she passes in and out of time: the child who hears a dryad prophesy, the goddess who sits on a throne or plays “in the arms of love / As starlight steadies in his perfect flesh,” the figure of meditation and grief who walks along the broken palace walls of home, the bold adventurer who has been to hell and drunk the blood of memory in the place where all she once loved is now shadow. Elsewhere in these poems are other potent narratives and revelations where mortal flesh slams into death and transformation: a woman dances with God, the poet speaks in the form of a dryad, a sister transforms into a fish and swims away, a doll is cast out from home and overtaken by a demon, the otherworldly infiltrates the leastmost dust, and a new mother walks with Death in his forest. Such metamorphoses and broodings on the door ajar between human and other remind us that Marly Youmans is “the best-kept secret among contemporary American writers. She writes like an angel—an angel who has learned what it is to be human” (John Wilson, Books & Culture).